<One huckle, please. Sunny side up. Company downsizing aside, Peggy Lee couldn’t wipe the smile from her face nor the thought of buttercream icing from her mind in early 2014 as she packed up her desk and said her good-byes to the place she had worked for nearly a decade. “All I could think was, ‘I’m going to be able to make cakes!’” she says. Five years ago, Peggy, of Brandon, MS, had never made a cake that didn’t come from a box. Then, one night in December 2009, she found herself on the couch with her husband, Gary, watching an episode of Cake Boss and making a surprising declaration. Gary responded with unwavering support. Just five weeks later, he gave his wife a cake baker’s kit for her birthday. “I was sitting there with the biggest, dumbest look on my face, thinking ‘now I have to do this,’” she says. But her road to sweets success didn’t start as a business venture. It was simply an itch that she needed to scratch. With distant childhood memories of watching her Grandmother Alma Adams making cakes, working with marzipan and baking cookies in a 1970s Hilton, N.Y., kitchen, Peggy knew icing and batter were in her blood; but, she had to look to the World Wide Web for lessons instead of to her late grandmother. Peggy began watching online video tutorials; logging hours on forums and cake sites; reading the Wilton beginner cake decorating books; and even signing up for an ill-fated Cake Decorating 101 class that she quit less than an hour into the first lesson due to frustration with her instructor. The success of Peggy’s first cake, an anniversary cake for her employer in 2010, was a surprise to her co-workers, as well as to Peggy. At the time, Peggy was working for JBHM Education Group in Jackson, MS, and the company was celebrating its 10-year anniversary. She was asked to make the cake for the celebration (pictured at right), and even she was surprised at how well it turned out. Three weeks later, she was commissioned to make a child’s birthday cake, then launched her Facebook page shortly afterward to share photos of her work. Thus, Peggy Does Cake was born (scroll through some of Peggy’s stellar cakes at the end of this article). 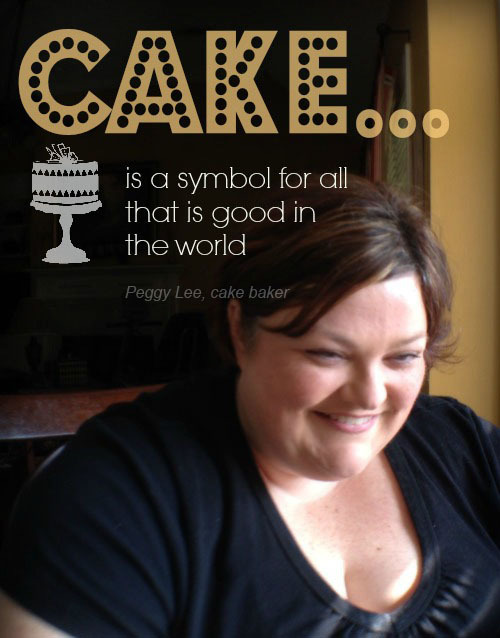 Peggy forged online friendships with others who shared her cake passion and built a rapport with the global cake community so quickly that, by February 2012, she was one of the first people in the online cake world to hit 10,000 followers on Facebook. By the following February, she was up to 40,000 followers, and, before the end of 2013, she had reached 200,000. But even with her online success, Peggy lacked the courage to make the leap from a steady paycheck at a desk job to full-time career as a cake maker in her own kitchen. Fate had to force her hand. Ironically, Peggy’s departure from the corporate world was due to changes at the very entity for which she had made her first cake. Her employer of nine years was bought out by a New York-based company that, slowly, began to make company-wide reductions in the workforce. But what could have been a hardship, turned out to be just the push she needed to give her cake business a real shot. Her work week now starts with fondant sculpting on Mondays and Tuesdays; baking and making components on Wednesdays and Thursdays; covering her baked creations with fondant and icing on Thursdays and Fridays; order pick-ups on Saturdays; and, though she manages her Facebook page and writes tutorials in her spare time throughout the week, Sundays are her primary days to make Facebook updates and upload tutorials. And, as if that isn’t enough to fit into a seven-day work week, Peggy is a regular cake-decorating blogger for Craftsy. A high-custom cake can take Peggy 20 hours of labor and usually begins with a phone call and a quick sketch to formulate the general schematic of the piece. She then uses Microsoft Paint to plan the color and design of her masterpiece. She is methodical about the entire process, which she approaches as more engineering than art. Peggy loves knowing that her hours of hard, meticulous labor end with crumbs on a plate because of what those crumbs represent. The next step for Peggy Does Cake is for Peggy to pursue making her own online video tutorials, a venture she anticipates will be well received by her audience and could further increase her visibility in the cake world. While pursuing cake making took a lot of bravery, Peggy says it has been worth it, and she encourages anyone who finds their passion to pursue it as soon as possible. Perfect timing! Struggling today with the demands of leaving the desk job for the passion job and at 45 no less! Thank you for the encouraging story!